At the gates of Queyras and the Guil valley, sat on the edge of a mountain overlooking Mont Pelvoux and the Massif des Ecrins, the ski resort of Risoul. The resort is surrounded by a tremendous larch forest, which makes up “La Foret Blanche (The White Forest)” ski area. Risoul is situated at 1850 m altitude, the chalets and buildings are built from wood and stone, giving the appearance that the mountain village has been there forever. The hotels, holiday resorts and rental apartments collectively have some 18 600 beds. The main street and the ski slopes are at the heart of this bustling resort always alive, well and smiling. Between 900 and 1300 m in altitude, the 17 hamlets of Risoul offer a selection of charming little hotels and traditional chalet based bed and breakfast accommodation. The historic villages have a rich rural and cultural heritage. Risoul is stuck halfway between authentic town and modern ski resort, the UNESCO world heritage site of Mont Dauphin (The fortified walled city of Mont-Dauphin) is only ten minutes away. Risoul is a quiet and comfortable place to spend a slightly different ski holiday without sacrificing the quality of the skiing. Risoul and Vars, the sister resorts found in the south east of France, share a network of larch forests which in turn are surrounded by an array of stunning mountain peaks. This perfect partnership is a union that satisfies hungry skiers eager for wide, fast ski runs and who are ready to do battle with the mountain. 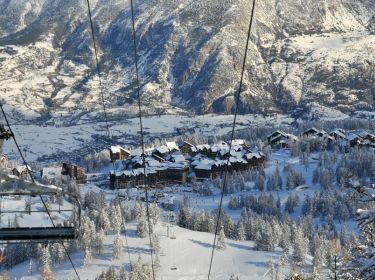 La Foret Blanche ski area finds itself nestled in the heart of the Guillestrois; this is a real mountain ski area which can be called home for all snow lovers who enjoy making the most out of this resort's outstanding potential! (185 km of marked ski runs!) As a leader within the French snow parks, Risoul is consistently at the forefront of this relatively new discipline in snow sport. Each year Risoul invests in the maintenance and development of their extensive park area: a fun zone, jumps, big air, gaps and rails are all linked together in the former 'Surfland' area which now hosts one of the largest and longest half pipes in France. If you are a beginner wanting to learn to ski and have a great time there is a special area set aside for you. Family friendly and safe, the small beginners green slope is free. Access is by a little drag ski lift. It is the perfect place to find your ski legs!! There are also two specially set aside areas reserved for tobogganing. They are free to use and one is even lit throughout the evenings. Risoul is a family resort therefore for a few years the team has been working on developing its child services, improving the infrastructure whilst enhancing family services, beginning with childcare. For toddlers the resort has a range of activities in place allowing kids to develop their skiing whilst learning and enjoying the fantasy world of winter in the mountains. The specially designed kids areas cater for children from 3 years and up (heated cabins, hot drinks, ski lift, tow rope, magic carpet, figurines, kids ski cross, etc). You needn't worry for the après-ski in Risoul, once the ski lifts have closed there are plenty more activities on offer to keep you and the children entertained: snowshoeing, paragliding, snow biking, snowmobiling, a natural ice rink, a cinema, gym, relaxation and wellness centre, Segways, quad-biking and paintballing to name but a few. In Risoul there is sure to be something for everyone.